Chris was a pleasure to work with. He made sure that all facets of the party were covered and he made sure that we were happy all night. He asked all the right questions to make sure we were all fully prepared and I never had to think about it when the party started. His music selection was amazing - we always had people on the floor dancing! Thank you for making our night special Chris! Dear Lauren and Matthew-You are welcome! It was a pleasure to be a part of your Wedding Reception. Best wishes. Chris truly made our wedding such a fun experience. He’s a great emc and he had everyone dancing throughout the entire reception. He’s rated #1 for a reason! Thank you Alana and Cody! It was a pleasure to be a part of your Wedding Celebration. Best wishes for a lifetime of love. Chris was great! Laidback but very helpful (and thus stress-free) in the planning process, very responsive to questions. He did a great job playing music everyone liked, and everyone had a great time dancing. Thank you Claire and Chad! It was a pleasure to be a part of your day! Beyond pleased with the services Chris provided for our wedding day! He was not only attentive to our music choices he also kept things moving smoothly throughout the night! Thank you Danielle! It was a pleasure to be a part of your celebration! Everyone at the wedding raved about you that the music was on point. Loved how willing you were to take charge when We needed you to and go above and beyond just playing music!! Will be recommending you to anyone else I know that is getting married! Thank you Katrina and David! Best wishes for a wonderful marriage. I don't have a single negative thing to say. Chis went above and beyond all of my expectations. Communication is great, he provides very handy forms for helping plan out your timeline. His audio gear is top quality and crystal clear, and he didn't mind me and my musician friends asking some questions at the end of the night about it! Chris was very accommodating to any and all special requests, and handled our ceremony perfectly, right down to handling sound for an acoustic guitar player. Yes, he can run audio for your ceremony itself too. We opted to add on some uplighting as well, which added some great atmosphere! Everyone was very pleased! I wholeheartedly recommend DJ C for any of your event needs. Thank you Ryan and Tanya! It was a pleasure to be a part of your Celebration. Best wishes ~ enjoy your ride. DJ C was absolutely wonderful! 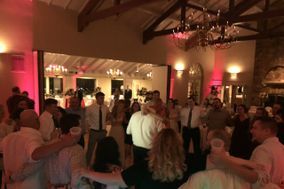 He was very responsive, friendly, and flexible during the wedding planning process and played all our song requests and requests from the bridal party and guests throughout the reception. We received so many compliments on him throughout the night and would 100% recommend him for your wedding reception! Your Wedding was so much fun! Great people, awesome venue, and the outdoor ceremony was perfect. Thank you for using my entertainment services. Chris was very easy to work with and accommodated all of our requests! DJ C was amazing to work with! He kept the party going all night long...there wasn't a single moment when the dance floor wasn't completely packed! He was very accommodating with our song choices...from the requested list, to polka to a last-minute merengue dance request. His uplighting package made our venue look absolutely gorgeous. DJ C even noticed that my cousin's baby was mesmerized by the lights during dinner, so he projected them on the floor for Karlo to chase around the dance floor. My father requested one song, the first dance song from my parent's wedding, which DJ C just happened to play as the final song of the evening. It was the perfect note to end on. I would recommend DJ C to anyone who is looking for an excellent DJ for their event. Thank you Christa and James! Your Wedding Reception was so much fun. The lighting did look awesome and your family and friends engaged with me well to make the entertainment come alive. Best wishes and I hope to see you both soon. Chris was a great DJ to work with. He worked with su to include the kind of music we wanted at our reception and was excellent at keeping people dancing and having a good time. He also MCed for us and setup music for our ceremony, all very professionally and seemlessly done. We opted for a lighting package as well and were very impressed with the dance floor and uplighting that he supplied, which we largely left up to him because we weren't sure what the best color options would be. He was a nice guy, courteous, and very flexible. Our wedding reception schedule got a little messed up due to illness at a certain point and he handled it very discreetly. Our guests didn't know the difference. I would expect execution like that from the best wedding planners. Additionally, his services were a great value with comparable packages and cheaper prices as other top notch DJs in the area. Our guests loved him! Thank you so much for including me in your special day! I really appreciate your attention to detail and providing a vision for me to deliver. Overall, Chris did an exceptional job at our wedding. He followed the loose guidelines and suggestions I prepared for him and supplemented my lists in an intuitive manner that kept my guests happy and dancing all evening. We had a minor snafu with our recessional song, but other than that everything went seamlessly. Would highly recommend him to anyone. Thank you Kim and Mike! It was a pleasure to be a part of your Wedding Celebration. The setting was just perfect. I was so pleased with the dancing and general flow of the evening. Chris...fantastic job with reception services! We absolutely loved every moment of the evening. You were very accommodating and took care of all or our DJ needs perfectly! Thank you...your 9/9/17 costumer. Chris is AWESOME!!! Chris did not disappoint! We had many people come and compliment us on the music. We provided him with a list with songs we liked and he did a PERFECT job blending the songs together so the party never stopped! He did a fantastic job with lighting. His suggestions for the lighting was on point! Way to go Chris! Would recommend to anyone!! Your Wedding Celebration at the SVCC was wonderful! I enjoyed all aspects and certainly the music requested - such variety and many guests danced the night away. Great job on the planning of your Wedding! It was a pleasure working with you and celebrating with your families. Your Wedding was fantastic and the guests were connected to the day through love, music and a deep desire to be a part of your Wedding. This was wonderful to experience. We used Chris for our wedding ceremony and reception and he was exceptional! He provided many useful tools to help me get started with my program/song planning for both events! He was prompt, professional and it didn't take long for him to get people on the dance floor and even stayed a little later than planned because so many people were still dancing and having a great time!! He reminded people of the guestbook and photo booth activities too so they didn't get missed, which was great. Chris has any type of music out you want, from rock to country to classics and he does a phenomenal job to ensure a great party! I know a lot of people at our wedding came up to me to compliment our DJ! I'd highly recommend him for any future events! Thank you Tiffany and Anthony! Your Wedding was wonderful. And we had excellent weather too. DJ C was very responsive and open to our suggestions. He ran the show and kept everything on time. When we booked with DJ C he gave us several forms to allow the process to get organized and allow us to feel confident. It was a special day and DJ C added to this value. Thank you! I love Weddings and La Primavera was an excellent venue for your Wedding Celebration. Chris was a phenomenal choice for us. Upon our first meeting, he instantly connected with my fiance and myself. He's such a sweetheart, and incredibly professional. During our wedding, we were pulled away for quite some time for photos, etc. and missed the start of the dancing. When we finally got to the dance floor, Chris was thoughtful enough to immediately play some of our favorite songs that we requested. He was focused on providing the best experience for us as his clients. Thank you Gina and Brandon! Chris did a great job with the flow of the reception - it was paced very well, and he kept the dance floor active. Many thanks to Chris for providing a great atmosphere! Gretchen and Stephen--your Rusty Rail Wedding was delightful. I am so happy that I could work with you and your families to have an excellent celebration. Chris kept our reception organized and fun! He was able to play all the songs requested. People danced the night away!! I highly recommend him for your wedding. DJ Chris was great! He did a wonderful job providing music for our wedding & was overall a genuinely kind individual. He went above & beyond for us & our guests. We highly recommend him! Your Wedding at the Susquehanna Valley Country Club was excellent. The food was wonderful and the staff always pleasant. I greatly enjoyed the traditions of John's family and the overall amount of dancers and guests who sang along to song after song. Wishing you both a wonderful future! Chris was absolutely wonderful! We could not have asked for a better DJ for our wedding. He did a wonderful job of playing music everyone enjoyed, and we received so many complements about his service. We had special music we wanted played during cocktail hour, and he had no problem making that happen! We are so grateful to Chris for helping make our wedding so special and fun! Thank you for including me in your day.